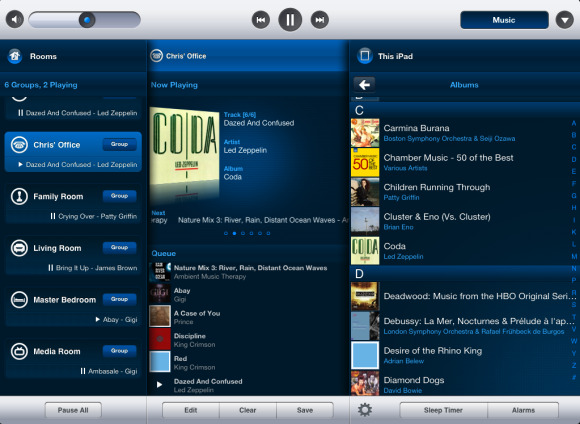 On Wednesday, Sonos released an update to its iOS controller software that allows you to stream your iTunes music directly from your iOS device to any Sonos unit on your network. Provided that you’re running iOS 6 on your device, version 3.8.3 is dead simple to update and configure. After updating the app through the App Store, launch it on an iPhone, iPod touch, or iPad. Tap the Music button to reveal the music sources you use with your Sonos system (music subscription services, free radio streaming services such as Pandora and Slacker, your iTunes library stored on a computer or NAS, and other audio devices plugged into a Sonos unit’s Input port). You’ll find a new entry called “My iPhone,” “My iPod touch,” or “My iPad.” Tap it and you can browse the music stored on your device by playlists, artists, albums, genres, tracks, compilations, composers, and podcasts. Tap what you’d like to play and it will be placed in your Sonos queue and streamed to the selected Sonos unit. As before, you can mix tracks from multiple sources into a single Sonos playlist. For example, choose one track from your iPhone, another from Spotify, yet another from Amazon Cloud Player, and finish it off with an album from Rhapsody. The playlist will play seamlessly. Unlike with Apple’s AirPlay you can choose to simultaneously play up to 12 different tracks through five different Sonos units—classical music in the living room, hip-hop in the daughter’s room, polka in the kitchen, punk in the garage, and ambient music on the patio, all played from the same iOS device. And if you'd like to play a single track simultaneously, you can do so to up to 32 grouped zones. Note that you can’t stream contents from your iTunes Match library nor can you play DRM-protected content, such as music purchased from the iTunes Store before Apple removed the copy-protection scheme. And this allows streaming only from the Music app's library. You can’t, for example, use this method for streaming music from a third-party application such as Spotify or Netflix.